At the beginning of last week, we announced to Fairphone 1 owners that we have stopped supporting our first phone. Practically speaking, this means that we will no longer sell spare parts for the Fairphone 1, and have stopped developing the software upgrade to Android 4.4. Personally and professionally, this was a bittersweet decision. The Fairphone 1 was our baby – the very first product we launched into the wider world – and we wanted to see it succeed for as long as possible. For ourselves, but more so for the community of pioneers who bought this phone and provided the financial springboard to start our company. However, after supporting the Fairphone 1 for three and a half years and the Fairphone 1U for nearly two and a half years, we’ve simply reached the point where it is no longer possible to keep supporting our first phone. Over time, the possibilities for continuing to support the Fairphone 1 have steadily decreased. It is now clear that we can’t keep spending resources on finding new options and loopholes without negatively impacting our company’s future. While we were producing the Fairphone 1, our manufacturing partner Guohong was managing most of the supply chain. After some time, they stopped producing phones altogether and our relationship with them ended. We had to contact the individual spare parts suppliers to ask them to produce extra batches for us. We ordered a certain amount of spare parts based on an estimate of the number of parts we would need in the near future, as well as the financial resources that were available at the time. But over the years, due to the fast pace of change in the electronics industry, most of the original Fairphone 1 spare parts have now been retired by our suppliers. In other words, the parts we need no longer exist. We’ve worked continuously to find new suppliers and convince them to keep making the parts – for example, we’ve worked with two different manufacturers to try to keep batteries in stock. However, after exploring every option within our financial means, the minimum orders required to produce new batches of spare parts is beyond what we can afford. While we are no longer able to support our first smartphone, our mission hasn’t changed: we want to expand the market for fair electronics and increase our positive impact in the electronics sector. And we’re making progress, slowly but surely. But creating radical change and combating major industry trends doesn’t happen overnight. Our first step was to focus on sourcing conflict-free minerals directly from conflict-affected countries… and integrating them into a smartphone. Because fairer minerals were our top priority with the Fairphone 1, we decided to put our own stamp on an existing phone design. By being the first phone company to offer spare parts in our online shop and working with iFixit to create repair tutorials, we were moving towards longer-lasting devices, but it wasn’t our primary objective. 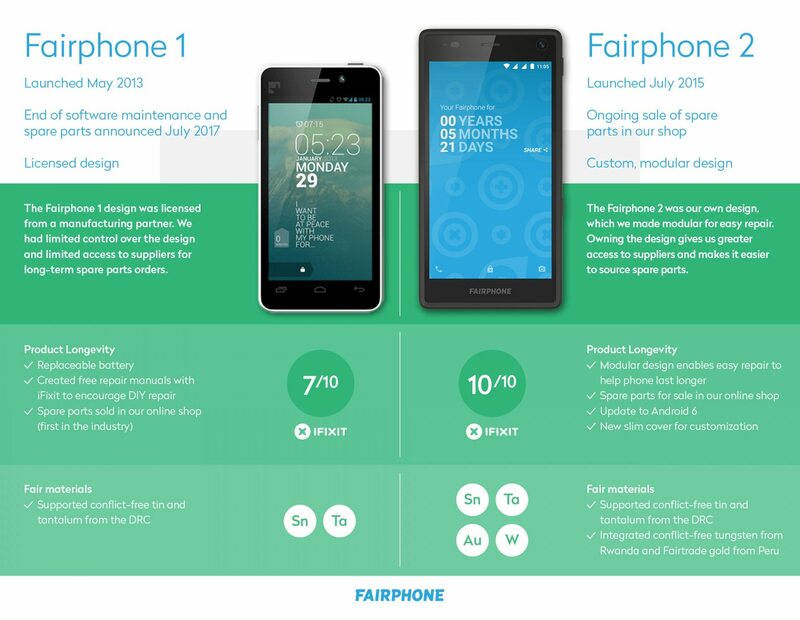 With the Fairphone 2, we took the next step by creating a custom, modular design. Having ownership over the phone’s design comes with a number of major advantages. For one, it allows us focus more on expanding the lifespan of our devices through repairability and spare parts. While components reaching end-of-life will always be an industry reality, the modular design will allow us to tweak individual modules to accommodate new parts. In addition, owning the design gives us direct access to our suppliers and a better overview of what’s happening in our supply chain. We’ve learned very valuable lessons from our Fairphone 1 spare parts challenges that will help shape our approach going forward. One concrete step is generating more working capital to be able to buy spare parts upfront, so we can continue to have spare parts available for customers in the coming years. Another step is to improve our planning and estimates to ensure our supply of Fairphone 2 spare parts meets the demand. After running low on stock in recent months, we are using the limited stock of displays we have to help as many customers as we can who contact customer support. Further, we plan to have all spare parts available in our online shop by the end of August. As our company continues to grow in size and ambition, it’s only natural that our products will evolve along with it. But the phone and brave owners who started it all will always have a special place in our hearts. While we may no longer be able to support the Fairphone 1, we want to encourage owners to keep using their phones as long as they can (using maintenance tips we’ve shared by email). No matter where the future takes us, we’re excited to have our community by our side as we keep working towards fairer products. What’s next for Android 7 on Fairphone 2? We're happy to announce the release of our February maintenance update (19.02.1).